Water is the most destructive element to pavement. Filling or sealing pavement cracks to prevent water from entering the base and sub-base will extend the pavement life by three to five years. Pavement expands and contracts with seasonal temperature changes. Consequently, cracks and joints are expanding and contracting when the pavement moves. Fillers do not expand or contract. Sealing the cracks with a flexible rubberized asphalt that bonds to the crack walls and moves with the pavement will prevent water intrusion. 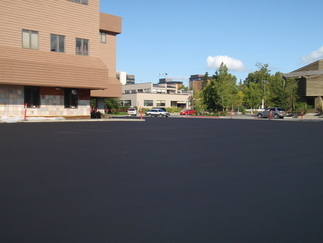 Alaska weather takes a toll on asphalt parking lots and driveways. When asphalt is not treated with the proper sealant, oxidation occurs and dries out the asphalt binder. When this occurs, the pavement loses flexibility and will start to crack. Oxidation is when the sun’s ultraviolet rays harden and dry out the asphalt surface. This accelerates erosion and reduces asphalt thickness so that in just a few years the pavement needs to be totally resurfaced. As oxidation occurs, then the rain, chemicals and other pollutants seep into the cracks and the pavement deterioration begins to rapidly progress. Once the process starts, the damage has occurred. Applying a seal coat protects the surface of the asphalt and reduces the damaging effects of oxidation. This application will greatly extend the service life of pavement as well as enhance the overall appearance. Sealcoating keeps and will even restore the original dark color of asphalt to greatly enhance the overall appearance of the property. If you were to look at a cross section of treated and untreated asphalt, you will see the difference that a sealcoat makes. In addition to the improved physical appearance, the sealed pavement becomes a smoother surface to make sweeping and maintenance easier and less costly. The most important aspect is the ability of the asphalt pavement to resist the damaging effects of gas, oil and chemical salts.